Have you been dreaming of going cruising but have never owned a sailboat and are hesitating because of the $$$ and the weeks of hard work required to properly outfit a boat? Well, I've got just the sailboat you need. She was designed and built by Bill Hardin, " Pioneer of the Taiwan Boat Building Industry," as a True Blue Water Sailboat, back when "cruising" was almost unknown. At 32,000 lbs. and 8500 lbs. 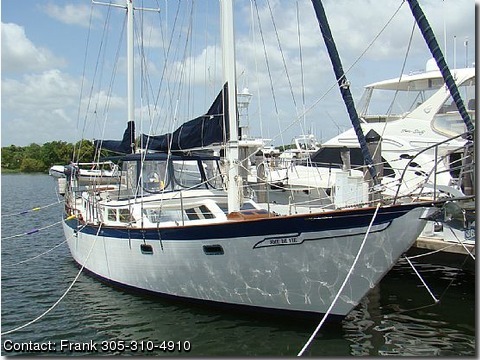 of ballast and a full keel w/ 5' 8" draft, she's very seaworthy, reliable and comfortable in the high seas. She is also a pleasure to live on, because she's so spacious and so well laid out and she has more storage than you could possibly imagine. She's also fully furnished and well equipped for you to move aboard and go cruise the islands as I did for many years. All you'll need to bring are your clothes and groceries, because I have removed only my personal items and am leaving everything else behind in totally reconditioned drawers, lockers and storage compartments. New s.s. chain plates, surfaced mounted and bolted through the hull. 130% Genny & a Staysail on Harken Reefing & Furling Systems. A Gennaker w/ sleeve is below. Masters' Queen size bed, w/ 2 large hanging closets, 7 lockers, 13 drawers for all the clothes the "Admiral" would ever dream of having w/ her. 2 Bose speakers. Main head w/ exhaust fan, sink, separate shower, Splendide Washer/Dryer.